The Laggan Hire Fleet Moorings at Laggan Locks are owned by Scottish Canals and consist of a 110m long pontoon mooring system and associated fingers. We are planning to replace this pontoon with a brand new system in a ‘like-for-like’ configuration. At the end of this project the new system shall be extended into Ceann Loch by approximately 30m. Replacement of the pontoon is driven by the need to maintain operational capability, whilst upgrading the facility to the latest Health & Safety standards. The proposed extension is required in order to accommodate proposals by SSE for a new hydropower scheme at Coire Glas, as well as to take advantage of deeper waters for enhanced operational efficiency. 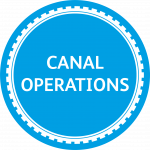 All works shall be carried out by Scottish Canals’ framework contractor, MacKenzie Construction Limited (MCL), and their sub-contractors. All fabrication will be carried out off-site with site access only required for removal of the existing system and installation of the new pontoon. Design of the new pontoon is ongoing, with procurement of materials and fabrication to follow in the coming weeks. This project will be delivered in 2 phases; site establishment for Phase 1 is expected to occur in the week commencing 11th March, with a view to completion of installation by 5th April. Phase 1 will involve replacement of the existing pontoon at the current location (i.e. no change in footprint). Phase 2 will commence in the autumn of 2019 at a date to be confirmed, and will involve additional works required to secure the new pontoon in the long term, and extend it into the Loch.